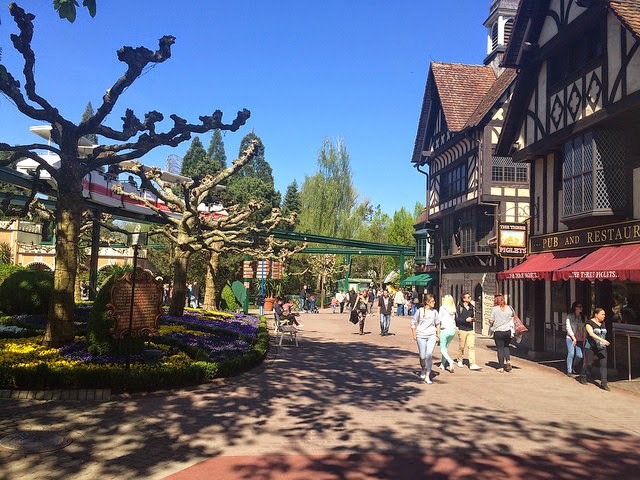 In the Part 1 of this Europa Park Trip Report I took a look at getting to the park, accommodation, and the attractions in the French pavilion. Part 2 here takes a look at more of the parks attractions and my impressions of them. The German area is the entrance of the park. We didn't even realise this area existed until the middle of our second day in the park, and we only saw it then by looking at the map. There are no huge attractions in this area, but it does contain a major restaurant and some picturesque gardens. The fountains in the garden move in time with the music every 30 minutes. I was expecting something a bit more dramatic than what I actually saw from these fountains. They are more of a background animation than something you would seek out to watch. The area does, however, contains a lot of seating to relax in and several sun loungers. There are some rides for really young children in this area of the park including a mini car and boat ride. Speaking of area for younger children there is a whole "Children's World" area which is by far the biggest playground I've ever seen and puts anything from Disney to shame. Lastly, you can catch the train and monorail which go around the park from the German area. In Part 1 I mentioned how the entrance to Italy was the holding area for the rest of the park, but there are also numerous attractions here too. The outdoor attraction here is Volo da Vinci which is an interesting concept. 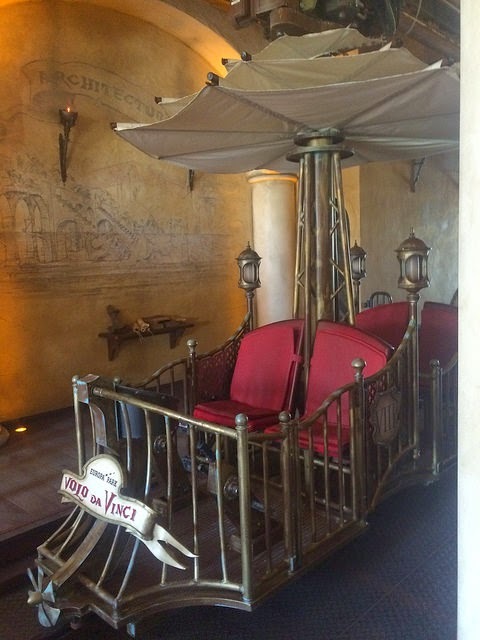 The idea is that you are sat in a Da Vinci designed flying machine. The ride takes you on a panoramic tour of the German area of the park, over the smaller kids attractions. By your feet you will find bicycle pedals which you can use to move faster. If you don't pedal at all you will still move albeit at a slower pace. We seem to have missed one of the rides in this area called Piccolo Mondo which translate to small world, but is nothing like the Disney ride of the same name. This is a dark ride going past scenes to do with Italy. This, I guess, is a testament as to how well integrated the rides were into the facades as we didn't see the show buildings at all in this area and completely missed the ride. I was hugely intersted to see Europa Park's version of Phantom Manor - or Haunted Mansion - which is called Ghost Castle. I had heard it was a poor Disney ripoff. As we went in, I was startled by how dark the actually show building was - it was almost pitch black and I couldn't see a thing. The first room was a room with paintings in it, just like in Disney's stretch room the doors closed and a series of paintings began to stretch. Except these ones were much less family friendly. I remember us all laughing at one of them. Just like at Disney there is a hanging in this scene, except here a doll is hanged just above the guests heads and not in the rafters. The main ride itself an omni-mover style system with a few nods to Disney's ride including a clone of the singing busts scene. 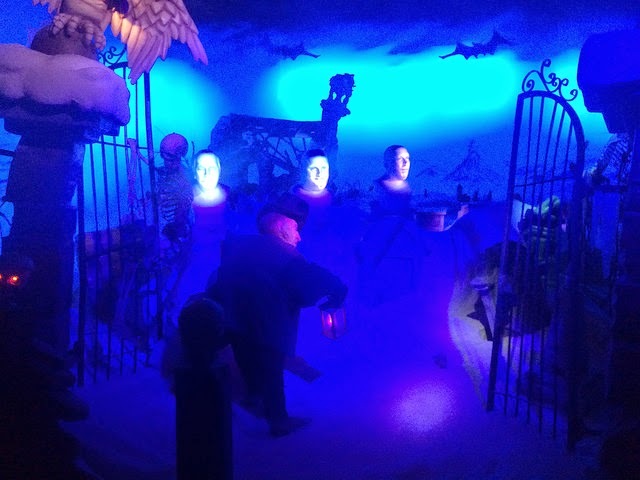 But most of the ride was just a collection of every single haunted house effect stacked next to each other from pop up ghosts to an electric chain. The ride lasted reasonably long but it was all quite repetitive with no storyline whatsoever mainly it is overall as I had predicted "a poor Disney ripoff". 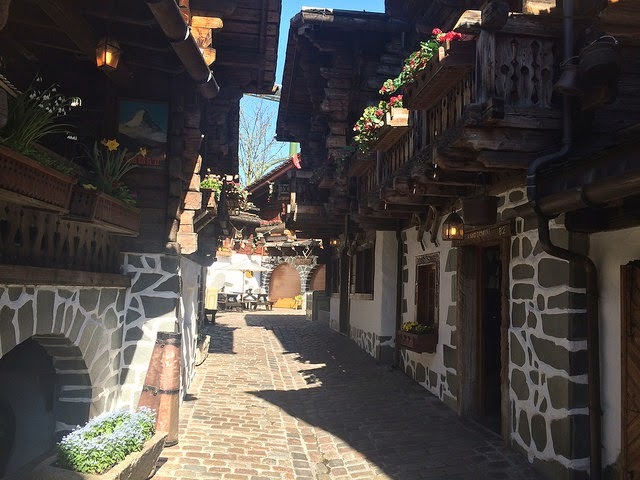 Before we knew it, we had entered Switzerland - again a very nicely themed area. Everything here felt quite small and quaint. I was quite surprised to see that one area even had a stream going from a tap down the cobbled streets just like it would in a small village - a nice touch which I saw used a few more times in the park that just gives it a sense of realism. The three rides here include a spinning plane ride which is a basic, but fun, fairground-style ride; Matterhorn Blitz a fun wild-mouse style coaster with a unique lift hill that I wasn't expecting and some serious speed; and Swiss Bob Run is a bobsled ride. The bobsled was rather unimpressive. The Greek area of the park features some beautiful theming, and is a stop of the EP-Express monorail. Atlantis Adventure is a shooting dark ride like Buzz but themed to sea creatures. It was fun though the guns had a very short wire, and the sound effect used for each shot was annoying and repetitive. This was a forgettable attraction to be honest. Flight of Icarus is a standard spinning ride. Cassandra's Curse is a spinning room/mad house type ride like I had previously ridden at Park Asterix. The problem here was that the room felt way too small and therefore things didn't really work in terms of scale, though the addition of air jets here was a nice touch. If it weren't for someone else in the group, I would have completely missed the entrance for this as it is so small and unremarkable. Pegasus is a family rollercoaster that can be compared to the Barnstormer at Disney world. We waited a good 10 minutes for this one due to the fact there was only one train running. Well, it still counts as a coaster credit so there you go. 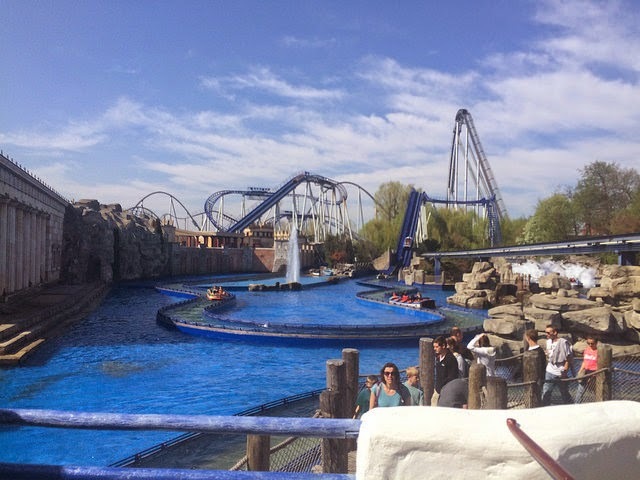 Finally, the flagship ride in this area of the park is Poseidon, a combination of a water ride and a rollercoaster. It is actually quite fun, featuring two drops though the coaster section of the ride is rough. This isn't one of the rides that will get you drenched, however. The temple theming (left of frame) was incredible both inside and out. 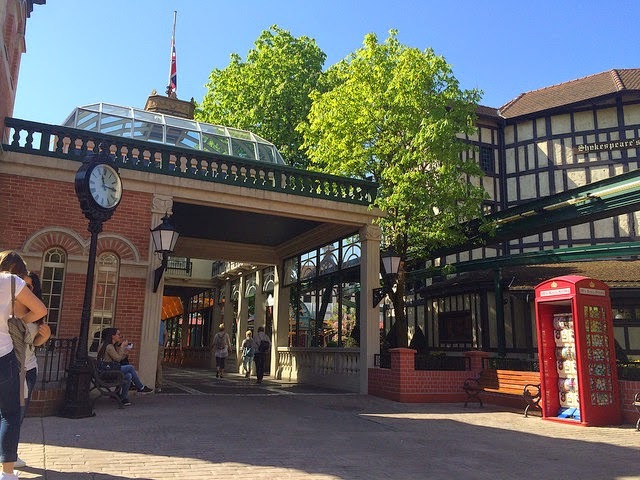 This area of the park very much resembles EPCOT's idea of the United Kingdom and features much of the same kind of architecture, though this version is larger. This is a stop on the the train which goes around the park. 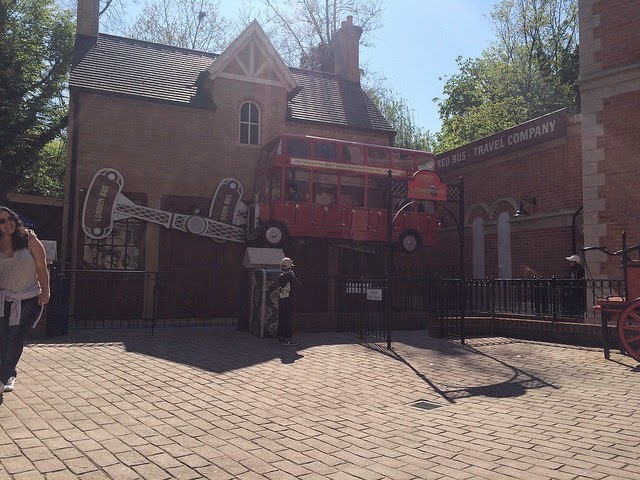 England features several small attractions including Water Lane, a walkthrough area with water jets; as well as London Bus and Crazy Taxi which are themed kids fairground-style rides. There is also a large creation of Shakespeare's Globe Theatre that hosts a live show. We did not get round to watching this. One unique attraction is Queen's Diamonds which is a (very) short laser maze where you must go through in under 1 minute avoiding the lasers in order to steal the Queen's Diamonds. This sounded good from the exciting music that played inside and it is a one-person-at-a-time experience. It was fun but ultimately there were only three lasers to avoid in a short section which can be done in under 20 seconds realistically. You get scored based on how quickly and accurately you make it through. It mustn't have been an expensive addition, and it was not hugely impressive but it was a fun unique idea that was memorable. Finally, in this area you will also find a carrousel, a paid-for shooting gallery and a car driving experience like Autopia called Silverstone race track. We've still only taken a look at about a third of the park's experiences so far. Check out Part 3 for a look at some unique attractions and restaurants.